Breast cancer survivors may recover from their illness only to face the same diseases as their “well” peers, such as hypertension and diabetes. Experts suggest a shared care model to keep breast cancer survivors healthy. Economic factors and bureaucratization are prompting more internists to adopt locum tenens employment as a career path. Read the stories of doctors who have made the switch successfully. A rheumatologist with 25 years of fibromyalgia research experience questions the current paradigm surrounding the elusive illness. Clinical updates from the reports compiled by ACP IntenristWeekly. 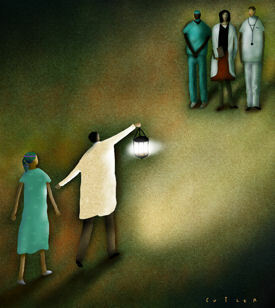 Breast cancer survivors often drift away from their primary care providerâ€”sometimes for years. A shared care model could help these women head off the other diseases that may also affect them, such as hypertension or diabetes. Would you make the same diagnosis in a 50-year-old patient that you would in an 80-year-old? This and a vague history led one internist to press for a better answer to a patient's anemia and SED rate. Electronic medical records are slowly pushing out the family history, eliminating valuable diagnostic information. But a free tool offers an easy way to restore important details to a clinician's files. PSA tests, fibromyalgia and reconsidering clinical impressions are discussed and debated by ACP members. In the midst of an economic recession and escalating health care costs, the College develops directions and solutions for health care reform. Can Obama team navigate rough waters of health reform? A large number of Americans favor health care reform, which could help the new President as he seeks to overcome mandates, taxes and pay cuts. ACP introduces a new book, “How to Write, Publish and Present in the health Sciences,” as well as six Webcasts from Internal Medicine 2009. A chief medical officer with Medicare explains how the agency listened to doctors to improve and made easier a program that promises more reimbursement for the care you're already delivering to your patients. New rules treat doctors' offices like banks and credit card companies, holding them responsible for identity theft the same way they're responsible for patient privacy. Federal regulations require doctors' offices to set up written procedures to protect against identity theft. Practice pearls outline steps to follow to comply with the new law. The Board of Regents voted at its spring meeting on several measures to enhance public and political perception of primary care and/or general internal medicine. The Board of Regents on Monday approved a policy monograph which offers several solutions to the impending shortage of primary care physicians. At this year's Internal Medicine meeting, ACP presented Evergreen Awards to 10 Chapters. A 56-year-old woman is evaluated for a 2-year history of joint pain and stiffness of the hands.